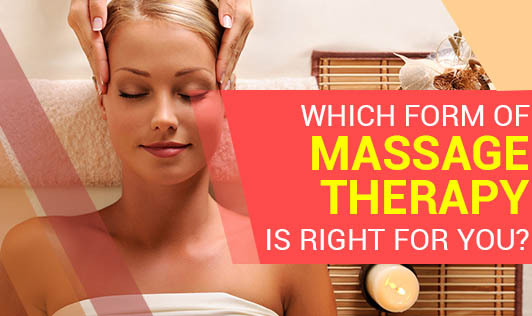 Which Form of Massage Therapy is Right for You? Therapeutic massage therapy is the hands-on practice of manipulating the muscles and other tissues in the body to reduce stress, relieve pain and promote relaxation and healing. There are various forms of massage therapy to choose from, each drawing on different physiological theories and touch techniques that vary in intensity. Swedish massage: This massage uses oil or lotion to reduce friction between the therapist's hands and your body and is performed directly on the skin. Best known for increasing the flow of oxygen to the muscles and tissues, this form of massage employs long, broad strokes on the superficial layers of the muscles. It's also favored by those seeking deep relaxation or repair of overused or injured muscles. Deep Tissue Massage: With this form of massage, long strokes and frictions techniques that spread muscle fibers wide apart are used to access the deeper tissues in the body and rub them against both overlying and further underlying tissues. Hot Stone Massage: A gentle, relaxing form of massage, hot stone massage incorporates the use of heated stones. These stones which are comfortably warm to the touch, but not hot enough to burn are positioned on areas of the body where treatment is needed or pressure points where the practitioner may perceive a block or restriction of energy in your body. Shiatsu Massage: It literally translates to finger pressure and incorporates various principles from Traditional Chinese Medicine which developed in Japan. Instead of deep kneading and friction techniques, shiatsu massage uses applied pressure from the fingers, knuckles, elbows, knees and feet along with gentle stretching to encourage better energy flow. There are many kinds of massages but you have to determine which form of massage interests and benefits you the most.